Having high blood pressure should not be a barrier to travelling. In fact, all forms of travel should be fine if you have high blood pressure and it is well controlled, even long distance. 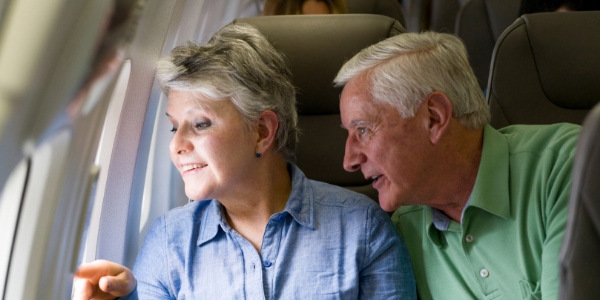 If your high blood pressure is not controlled by medication then your GP can advise you about whether it is a good idea to travel, especially if your journey involves flying, as high altitudes can have an effect on blood pressure. Can you fly with high blood pressure? Yes, but you should talk to your doctor before making any travel plans, however it is likely that you’ll be okay to fly if you have high blood pressure and it is well controlled with medication. Travelling by air can be quite stressful in itself, with queues, security to clear and tight deadlines. If you are flying, try to reduce the amount of stress that could occur at the airport by arriving in plenty of time. If you’ve got an early flight, then it might be worth considering staying at an airport hotel the night before. There are plenty of hotels to suit any budget, but aim to book one that’s close to the terminal you require. Allow plenty of time to clear security and bring extra medication in your hand luggage, along with a prescription, in case tablets go missing or more are needed when abroad. Your pharmacist can advise you of international generic and brand names for UK medicines. If you have high blood pressure you might also be at a greater risk of developing deep vein thrombosis (DVT), so we’ve put together a handy graphic which shows you the easy exercises you can do while flying to help prevent DVT. Does flying affect blood pressure? Yes it can. At high altitudes, even in a pressurised aircraft cabin, passengers are at risk of hypoxaemia (low oxygen concentration in the blood). Although this isn’t felt by most people and won’t necesssarily affect people with a high blood pressure, if you have heart disease or heart failure – you could be more sensitive to hypoxaemia. Take some snacks from home for the journey, as airlines tend to give out salty peanuts or crackers, which can increase blood pressure levels. It’s also a good idea to avoid alcohol and sedatives as they can make you more prone to staying in one position, or falling asleep, during the flight. If your GP has expressed a concern about the altitude and you require an oxygen tank, these can be rented from the airline if you call in advance. Can I take a blood pressure monitor with me? Yes, certainly in your checked-in luggage. There is no benefit to checking your blood pressure while aboard a flight (unless you have been advised to do so under special circumstances by your doctor). If your doctor thinks you need to have one on board the flight, it is worth calling the airline to check that it is ok to bring aboard the plane. Is there a blood pressure limit for flying? There isn’t any legally imposed limit as far as we’re aware, but a high blood pressure must be controlled with medication before you travel for your safety. For example, blood pressure is considered high if over 140/90mmHg, so if your blood pressure is consistently above this value then it is important to reduce it. Buy travel insurance that covers pre-existing medical conditions to cover any high blood pressure related medical costs, should you need treatment while you are away. Pack your medication in your hand luggage so that it is easily accessible during travel. Remember to pack extra medicines to cover for any delays or loss. Avoid alcohol and any medication with a sedative effect – they can make you less active during a flight. Carry written information on your medication and dosages, along with contact information on who to contact in the unlikely event of an emergency. Please note: The materials in this post are in no way intended to replace the professional medical care, advice, diagnosis or treatment of a doctor. The article does not have answers to all problems. Answers to specific problems may not apply to everyone. If you notice medical symptoms or have questions on the topics raised in this article, please consult your doctor.